On one of the hottest and most humid days of the summer (with a heat index of over 100 degrees), thousands of athletes awoke hours before dawn to participate in the 15th annual Panasonic NYC Triathlon. The race held this past Sunday began with a 1500M swim in the Hudson, and then athletes transitioned to a 40K bike along the Westside Highway, before completing a 10K run through Central Park. This particular event holds special significance with the SPEAR team. Our own Director of Operations, Ryan Kitzen, who participated this year, proposed to his wife at the finish line of his first NYC Triathlon in 2009. And with fifteen SPEAR patients also participating, the satisfaction of reaching that red carpet at the finish was all the more sweet. The SPEAR team was also present at the finish line, volunteering to aid athletes post-race with various injuries and needs. 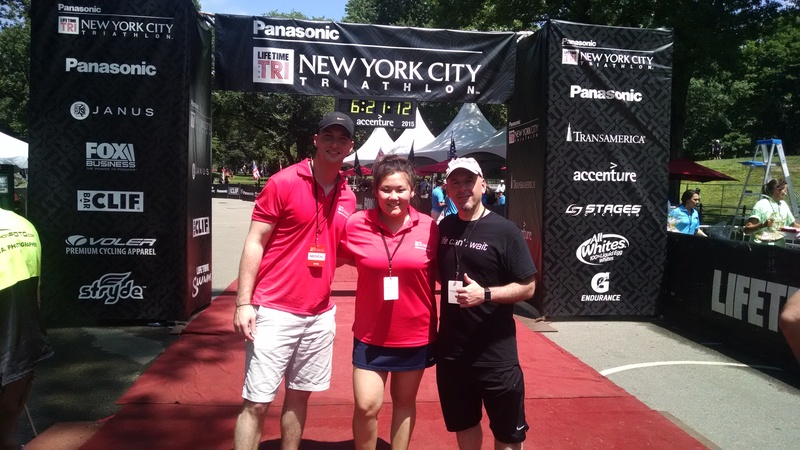 “Participating in the NYC Triathlon allowed me to relate even better to my patients and it makes me a better clinician. Having gone through physical therapy last year, following back surgery in 2013, the opportunity to get in the water and on the road with patients we’ve treated mere months ago, knowing what they’re going through, running alongside them, and finishing with them, makes the experience even more rewarding than finishing it alone,” Kitzen says. Completing this race has truly brought Kitzen’s professional and personal life full-circle, proving the necessity and success of physical therapy in the most real way. As a Manhattan-based company serving New York City, we enjoy volunteering locally with the community who has supported us. Our team volunteered at the finish, offering water, assisting with heat stroke prevention, taping joints, and stretching athletes out after the grueling race. Staff Physical Therapist at SPEAR’s West 57th location, Joe Martinez, with an assortment of Manhattan medical professionals, was with athletes as they completed the race, taping up ankles and knees, stretching out sore muscles, and ensuring athletes were well hydrated. “As a physical therapist and a runner, I enjoyed volunteering at the event. Interacting with the athletes and being able to help, alongside the others in the medical tent was exciting, especially as each big wave of finishers came through. The whole operation went smoothly, even with the flurries of athletes. Each athlete was properly attended to for their specific needs,” Martinez says. With a reputation as sports medicine specialists, at SPEAR we don’t take lightly the opportunity to help high-performance athletes train and perform better to accomplish their goals and excel. The most difficult aspect of training for and participating in a triathlon or any multi-discipline race is getting comfortable with being uncomfortable. The task as a whole can seem overwhelming. Coupled with physical health, taking one task at a time versus looking at it as a whole is the key. The mental is oftentimes more difficult than the physical. And it is important to us to support both. As physical therapists, athletes come to us with goals (which sometimes they believe are unachievable), and we are able to be a part of their journey to better physical health and strength, which ultimately allows them to achieve those goals. “Watching patients complete the NYC Triathlon, knowing their struggles and the intense amount of work they put into training is so rewarding,” says Kitzen. At SPEAR, we see all types of triathletes; athletes interested in beginning triathlon training who are working with existing injuries, those who realize injuries during training, and recovery after triathlons. The extensive training involved puts the body through so much physically and mentally. Part of the sport is getting yourself to the start line. And we aim to be a part of the journey through the finish line.